Muslim women of all ages, economic status, educational backgrounds, sexual orientations, and from different parts of historically Muslim countries suffer the kinds of atrocities that violate common understandings of human rights and are normally denounced as criminal or pathological, yet these actions are sustained because they uphold some religious doctrine or some custom blessed by local traditions. Ironically, while instances of abuse meted out to women and even female children are routine, scholarship about Muslim women in the post 9/11 era has rarely focused attention on them, preferring to speak of women's agency and resistance. Too few scholars are willing to tell the complicated, and at times harrowing, stories of Muslim women's lives. Women and Islam: Myths, Apologies, and the Limits of Feminist Critique radically rethinks the celebratory discourse constructed around Muslim women's resistance. It shows instead the limits of such resistance and the restricted agency given women within Islamic societies. The book does not center on a single historical period. Rather, it is organized as a response to five questions that have been central to upholding the 'resistance discourse': What is the impact of the myth of al-Andalus on a feminist critique? What is the feminist utility of Edward Said's theory of Orientalism? Is Islam compatible with a feminist agenda? To what extent can Islamic institutions, such as the veil, be liberating for women? Will the current Arab uprisings yield significant change for Muslim women? 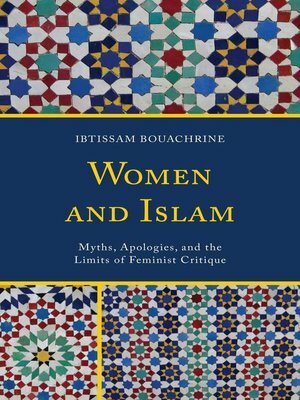 Through examination of these core questions, Bouachrine calls for a shift in the paradigm of discourse about feminism in the Muslim world. Ibtissam Bouachrine is associate professor in the Department of Spanish and Portuguese and the director of Middle East studies at Smith College.